Maybe my kids will wash their hands more?? I just painted some simple sunflowers using acrylic paint from the craft store (my powder room is yellow and the rug has sunflowers). After it dried, I white washed over it with thinned down white acrylic paint so the lettering would show clearly. I then created the word art in Illustrator and saved it as an SVG file so I could cut it out using my Silhouette Cameo digital cutter. I use a font family called “Thankful”. I really like this collection of fonts – so many choices and they go so well together. I did add a stroke outline to the thinnest font, just to make sure the cutter would cut it and I could transfer it easily. The canvas is 10″ by 20″ – so I created a long, thin arrangement. I cut the words from dark brown permanent vinyl and transferred them to my canvas. I put a book under my canvas to support the fabric so I could rub the vinyl firmly. If you would like to make something with this word art, you can download the SVG here. The PNG version is here. I’m not sure if I can still offer free files in Silhouette Studio format (I know I am not allowed to sell them). Does anyone know if free .studio files are still OK? This entry was posted in Cutting Files, Freebies and tagged Cutting files on October 16, 2015 by Cathy. Welcome to the Paper Garden Projects stop on the February 2015 DigiScrap Parade route. If you’re following the Parade route from start to finish, you should have arrived here from Two Tiny Turtles and your next stop will be Mari Koegelenberg. If you get lost along the way, simply head back to the main DigiScrap Parade site to view the master list and get back on track. You can download my parade contribution here. I’ve included a special coupon in my download in case you might want to stop by my Digichick store and take a peek. This entry was posted in Freebies on January 31, 2015 by Cathy. I had the pleasure of collaborating with Kim of Kimeric Kreations to make this new digital craft kit. Its called City Sidewalks. It has a lot of nice, flat graphics perfect for hybrid crafting. Speaking of hybrid crafting, I created a little freebie for you using the kit. Its a set of gift tags. The download includes the individual tags, but also a PDF of the collection so you can just print them, cut them apart and use them. I kept the edges straight for easy cutting. You can download them here. 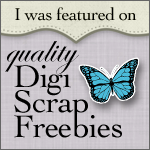 This entry was posted in Freebies and tagged DigiChick on December 5, 2014 by Cathy.